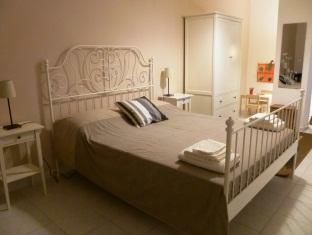 Have a question for B&B Le Comari Salentine? Offering quality accommodations in the sightseeing, restaurants, culture district of Lecce, B&B Le Comari Salentine is a popular pick for both business and leisure travelers. Only 0.2 Km from the city center, the hotel's strategic location ensures that guests can quickly and easily reach many local points of interest. This modern hotel is in the vicinity of popular city attractions such as Museo Provinciale, Merzbau con-temporary lab, Chiesa del Carmine. The facilities and services provided by B&B Le Comari Salentine ensure a pleasant stay for guests. Top features of the hotel include free Wi-Fi in all rooms, Wi-Fi in public areas, family room, coffee shop. Step into one of 2 inviting rooms and escape the stresses of the day with a wide range of amenities such as television LCD/plasma screen, internet access – wireless, internet access – wireless (complimentary), non smoking rooms, air conditioning which can be found in some rooms. Besides, the hotel's host of recreational offerings ensures you have plenty to do during your stay. Enjoy unparalleled services and a truly prestigious address at the B&B Le Comari Salentine. Conveniently located between train station and historic centre. Very large apartment and well-equipped with kitchen and air conditioning. My stay att the B&B Le Comari Salentine was by all means enjoyable. Starting from the friendly welcome of the host, his kind advice on what to see and do and what to eat to the super cleanliness of the room. Paula (his wife) prepared the most varied and wonderful breakfasts during my stay. Also the location, close to the train station (5 min walk) and inside the historic center (but in a modern buidling), was perfect. The bus stop was also just a few minutes walk away. All in all, I can highly recommend this B&B for anyone going to Lecce. Very well placed to see the city, good sized room with bathroom as shown on website, breakfast buffet to help yourself, and reasonably priced. Owners friendly and helpful and told us where to park for free. The reservation was for my college-age son. When he missed his train from Rome to Lecce, he was going to arrive a day later than his reservation. He also found out that he would need to stay an extra day. I called and emailed the management ahead of time to let them know the situation and they worked with us to accommodate my son. They were helpful and friendly. I highly recommend them. Lecce is one of the loveliest cities I've been to on my 7 months so far, and this lovely B&B on the edge of the old town is a must to stay in. Great value, free wifi, one of the best free breakfasts in Italy. Coffee, juice and yogurt any time of the day. Make sure to head into town for sightseeing and a great and inexpensive meal. We had a wonderful one night at this b&b! Everything about it was perfect: the room and bed were comfortable, the room was large and there was hot water in the shower. The couple running the hotel were as helpful as could be, even providing us with a guide book in English for Ostuni. There was free wifi, though I couldn't get my computer hooked up to it. They kindly called our next night's b&b to let them know we were coming. Breakfast was tasty and they had a refrigerator, microwave and espresso maching you could use in the common areas. The location was about 10 minutes walking from the train station and close to the old city. I'd be happy to return to this great place in the stunning town of Lecce. Très bon accueil, chambre grande, bien entretenue, petite cuisine équipée et frigo à disposition. Petit déjeuner très bon pour ceux qui aiment le sucré (pâtisserie fraîche). A soli 5 minuti dal centro storico è in ottima posizione tranquilla e comoda, con possibilità di parcheggio. Le Camere grandissime accoglienti e silenziose con spazi per bambini, ordinate pulite e dotate di proprio bagno, condizionatore, phon, bollitore e angolo cucina. Il personale è sempre stato consigliero e disponibile. Colazione a scelta nel bar accanto. Lo consiglieremo ai ns amici! Poi Lecce è meravigliosa, visitatela!!! Struttura ristrutturata a nuovo, pulitissima e vicina al centro storico, ai ristoranti ed ai negozi. Proprietaria gentile e disponibile per ogni esigenza. Ottimo rapporto qualità/prezzo. siamo stati benissimo. appartamento stupendo aria condizionata in centro angolo cottura in camera. proprietari disponibilissimi. Il B&B è in posizione comoda rispetto alla stazione FS e al centro città. La pulizia, lo spazio a disposizione, la completezza del servizio e la cortesia dei gestori ci hanno pienamente soddisfatto. Posizione ottima: vicino alla stazione e al centro. La proprietaria è molto disponibile e gentile. Le camere sono molto molto grandi, ristrutturate, pulite e con un bel bagno. Soprattutto il letto è comodo. sono stato 2 notti in questo b&b. purtroppo ero lì per lavoro e per motivi di orario non ho potuto fare colazione (pasticceria salentina, che mi sono perso!). la proprietaria era molto dispiaciuta di questo. a disposizione c'è sempre la macchinetta del caffè e il frigo (acqua, latte e succhi di frutta gratis): a volte un bicchiere d acqua la notte vale oro! purtroppo manca l ascensore e le camere sono al secondo piano. consigliato per tutto! !